We started off the 2020 cycle with an informal heuristic: While many long shots would run for president, we would focus our coverage on candidates who had previously held elected office; others would have to earn enough media attention to prove they should be taken seriously. When businessman Andrew Yang, a political rookie, launched his presidential campaign with a New York Times profile in February 2018, he didn’t meet our standard for coverage. But Yang now looks likely to qualify for the Democratic primary debates this summer, so here is our belated take on the strengths and weaknesses of his candidacy. Though just 44 years old, Yang has already built an impressive résumé in the private sector: After graduating from law school and founding a failed tech startup, he became CEO of an $11 million test-prep company that was acquired by Kaplan and founded the nonprofit Venture for America, which trains college graduates interested in working for startups. But the centerpiece of his campaign is a universal basic income. To counteract the effects of job automation — which he calls the “greatest technological and economic shift in human history” — Yang is proposing that the government give $1,000 per month to every American over the age of 18. He says this “Freedom Dividend,” which would be funded in part by a value-added tax on corporations, would make it easier for people to pay their bills and adapt to the changing economy. Yang is the only 2020 candidate thus far to put a universal income front and center, and his campaign says it’s been key to attracting support. But it’s probably not a strong enough issue to propel Yang to victory on its own. A Gallup poll from 2017 found the concept to be divisive — 48 percent supported a universal basic income, while 52 percent opposed it. Support was higher (65 percent) among Democrats, but not overwhelmingly so. That said, if Yang does indeed make the debate stage, he could succeed in making the issue a part of the national conversation. 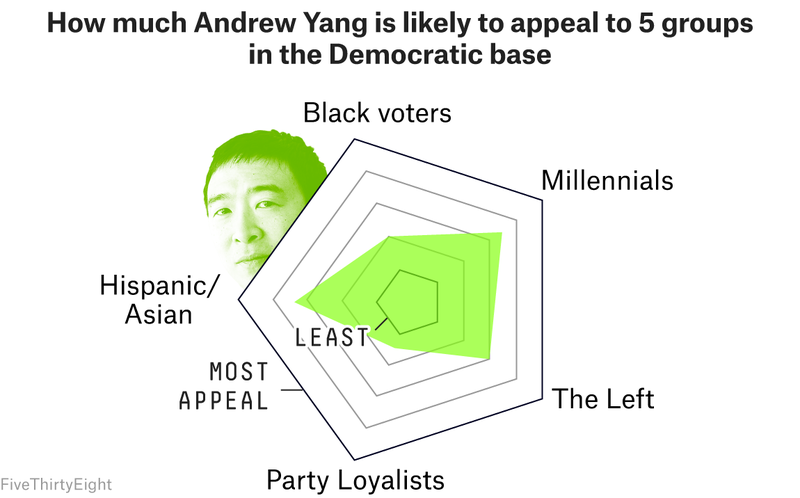 Yang’s strongest constituencies might be Millennials and Hispanic and Asian voters. Yang has a strong following on Reddit and his fans have been producing hundreds of memes there and on Twitter, both platforms whose user base skews younger. And should he win, Yang would be the first Asian-American president.1 Unfortunately for Yang, Asian voters are only about 5 percent of the Democratic primary electorate. Graumann told FiveThirtyEight that the campaign is aware of its potential to make history and believes it can improve Asian-American participation in the political process (the group’s turnout rate is usually quite low), but that Yang’s Asian identity is not currently a big part of his campaign or rhetoric. Party Loyalists will likely be Yang’s weakest constituency. He is clearly running an outsider’s campaign, although Graumann says Yang is “not in it to blow up the system.” Still, Yang is one of the few candidates with no endorsements from the Democratic political establishment so far. One constituency that might be in his corner, though, is the tech establishment. But this will probably help more with scaring up money than with scaring up votes. The campaign claims Yang has already reached 65,000 unique donors, which is one of the thresholds for qualifying for the first two debates. And Graumann says the campaign has raised about $950,000 in February and the first half of March, which would be solid for a House or Senate candidate, but it probably won’t cut it for president, especially if Yang doesn’t plan to self-fund his campaign, which Graumann says is the case. Yang faces other challenges as well. His polling numbers remain low: His best performance in any poll in FiveThirtyEight’s database has been 1 percent. Still, that’s partly because not a lot of voters have heard of him, and low name recognition at this point in the cycle is not necessarily fatal for a campaign. But even among Democrats who know enough about him to form an opinion, Yang’s favorable ratings aren’t anything to write home about. In four national polls taken so far this year, Yang’s net favorability rating (favorable rating minus unfavorable rating) among Democrats has averaged +6 points. And he’s actually underwater in the crucial early state of Iowa. This could reflect the possibility that, in the age of President Trump, Democrats don’t want to nominate a businessman of their own; other wealthy Democrats like former New York Mayor Michael Bloomberg and entrepreneur Tom Steyer had similarly middling net favorability ratings before they decided not to run. And overall, it’s extremely difficult historically to win a presidential nomination if you haven’t held elected office before. Because of his lack of political experience, narrow coalition and niche platform, Yang remains a long shot for the Democratic nomination. But we can no longer say with confidence that he is any more of a long shot than several other candidates. That’s an accomplishment in and of itself. And just as Sen. Bernie Sanders did with policy proposals like “Medicare for All” and free college in 2016, Yang could accomplish something even by losing: He may yet succeed at bringing the universal basic income into the Democratic mainstream. Sen. Kamala Harris, who is part Indian-American, would also earn this distinction.